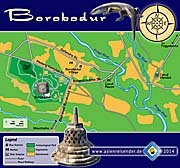 Map of the Archaeological Park of Borobodur and the wider surroundings. 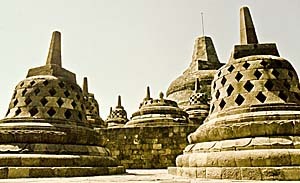 Borobodur is a magnificent medieval buddhist temple in central Java. 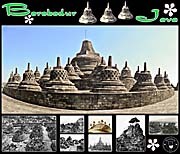 The photocomposition of Borobodur shows the state of the monument today as well as it was before the first thorough restoration phase in the years 1907-1911. 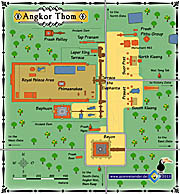 A 'Map of Angkor Thom'. Bakong is the largest temple in the Roluos Group. 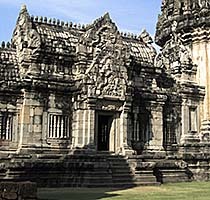 It was part of the first capital of Angkor in the 9th century. The 'Gates of Angkor Thom' are all remarkable. That's the least visited West Gate. Sukhothai Historical Park is one of the most remarkable sights in Southeast Asia. Wat Si Sawai is one of twenty temple sites in the necropolis of Old Sukhothai. Wat Chang Lom, the temple of the elephants, is one of the most remarkable sights inside of Si Satchanalai Historical Park in north central Thailand. Thailand's main cultural site is, at least counted by the number of visiting tourists, Ayutthaya Historical Park. It's a large island with a great number of ancient ruins around, declared a UNESCO World Cultural Heritage in 1991. Ayutthaya was Siam's former capital, before it moved to Bangkok. The National Museum of Lopburi is situated in the old Royal Palace of king Narai. It houses a large collection of historical items who date back to prehistorical times. 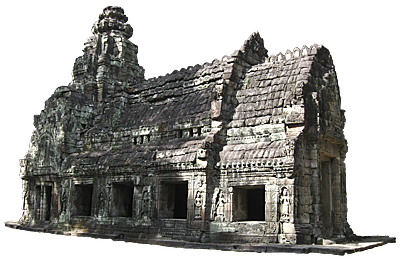 For a virtual visit to Ta Prohm, a remarkable pearl of Angkorian architecture on the zenith of it's arts, click the image or the link. 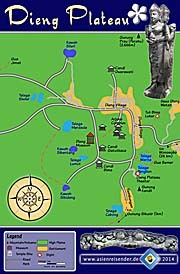 The article on the Dieng Plateau in central Java comes with a map. Click on the map to get it. 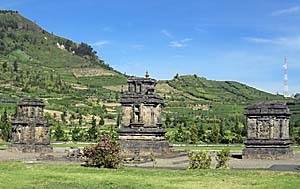 When coming up the Dieng Plateau nowadays, one can barely imagine how the place might have been some 1,300 years ago. A big temple city with more than 400 temples and an adequate civil infrastructure coined the high, volcanic plain. After natural disasters the place was abandoned and the remaining temples were sunken to the ground of a mountain lake. Rediscovered in 1856, the lake was drained and the last eight monuments came back to daylight. Meanwhile nicely restorated they give witness of an ancient culture and represent the oldest stone buildings found on Java. 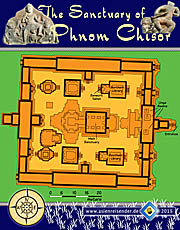 For a 'Map of Phnom Chisor', an 11th century Khmer temple on a mountain top, click the image or the link. The 'White Elephant Hall' or better the 'Royal Dressing Room' of Phanom Rung. 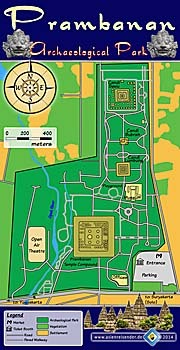 A 'Map of Phimai Historical Park'. 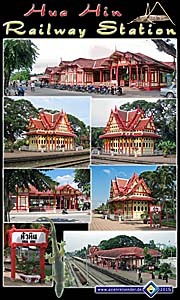 The Railway Station of Hua Hin / Thailand is seen by many as the most beautiful in the country. One of the barely known, very remote sights in Cambodia is Phnom Bayang, a 7th century hindu temple complex. The Royal Palace is seen as the most notable sight in the Cambodian capital Phnom Penh. 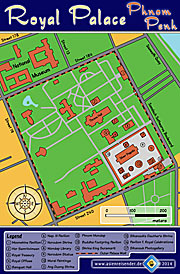 Here you find a 'Map of the Royal Palace of Phnom Penh'. Click the link or the image to have a closer look on it. 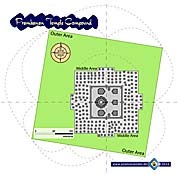 A set of maps of Prambanan Archeological Park and the concept of Prambanan Temple Compound. They illustrate the Prambanan page. 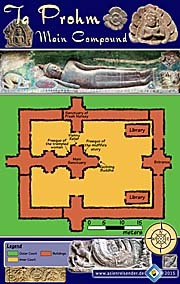 A 'Map of Prasat Ta Muen'. 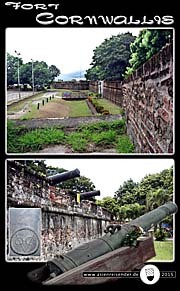 Fort Cornwallis on Penang Island is the largest colonial fortress in Southeast Asia. Surprisingly, there is a number of old buildings representing colonial architecture in Songkhla, south Thailand, although the place was never ruled by a colonial power. 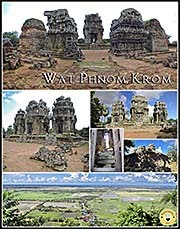 Wat Phnom Krom is an Angkorean temple monument on a mountain overlooking the great lake of Indochina, the Tonle Sap. The Vietnamese clocktower in Nakhon Phanom. 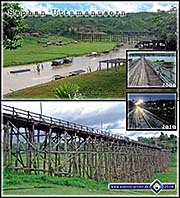 Uttamanusorn Bridge, which connects Sangkhlaburi and Wang Kla, is the largest handmade wooden bridge in Thailand. It's worth to have a look for this sophisticated construction. 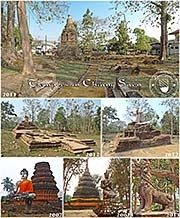 Chiang Saen is one of Thailand's oldest places, situated in the Golden Triangle. 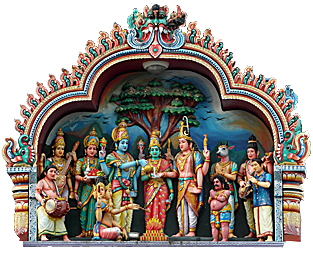 It has a number of temples in- and outside of it's old city walls. The place looks like a large outdoor museum. Southeast Asia has a great variety of sights to visit. Among them are some of the most impressive of the world, as magnificient Borobodur on Java, famous Angkor Wat in Cambodia and Pagan in Burma/Myanmar. Many more are worth to be visited and many of the smaller sights are sometimes the nicest - particularly when few people go there. They can be sometimes very surprising. 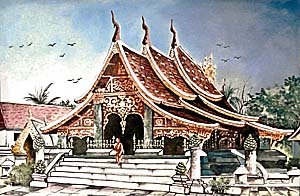 Who, for example, expects two temples in central Java who look like they were built by the middle-American Maya culture? 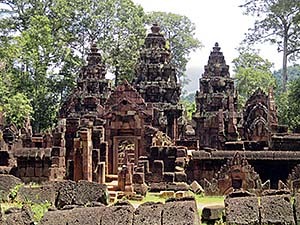 The huge, 400km2 large Angkor Archaeological Park is a cultural landscape in northwest Cambodia. It was the center of the medieval Angkorean empire with several of it's capitals. 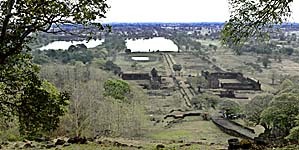 Angkor was the largest pre-industrial city in worlds history and lasted over more than 600 years. In this time the ruling class of high priests and godkings let built a number of great temples in the area. Nowadays the sights, among them Angkor Wat and the royal city Angkor Thom, are the by distance most visited sights in Southeast Asia. Nowadays a meaningless village close to the Cambodian / Vietnamese border, Angkor Borei was once among the first urban centers of Southeast Asia. Situated in the Mekong River delta, some suppose that Angkor Borei was the capital of Funan, Southeast Asia's oldest civilization. The discussion about the site of the capital has an ideological implication; if the ancient Khmer had their center or origin in nowadays Cambodia or in nowadays south Vietnam. 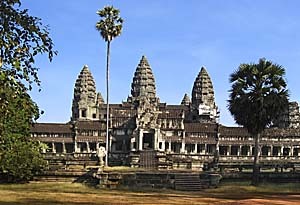 Southeast Asia's classical empire of Angkor moved it's capital over the centuries several times. All of them were placed in the same area, means some kilometers around of nowadays Siem Reap, northeast of the great Tonle Sap Lake in Cambodia. One of these capitals, and it was also the last, the best-known and longest lasting of Angkor's capitals, was Angkor Thom. The famous Bayon was the state temple of Angkor Thom. The Siamese kingdom of Ayutthaya was one of the great empires of Southeast Asia in the late middle-ages until early modern times. It was the successor of the in Indochina dominant empire of Angkor. 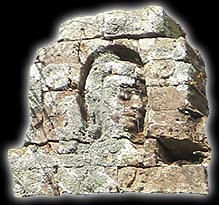 An army from Ayutthaya besieged and sacked Angkor Thom in 1431/32. 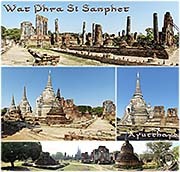 Ayutthaya filled the role of the most influencial power on the Southeast Asian peninsula from then on. 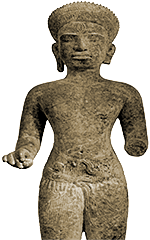 Many skilled specialists were brought from Cambodia to Ayutthaya, influencing the newly emerged power deeply. Ayutthaya was in the 17th century described by Asian as well as Western visitors as one of the most meaningful places in the world. French envoys as Simon de la Loubere (1687/88) compared Ayutthaya with the contemporary Paris in wealth, political power and cultural influence. Ban Chiang Archaeological Site is a very special place. It was in pre-historic times inhabited over a timespan of at least 3,500 years. The first neolithic settlers in Ban Chiang mark the transition of a nomadic living species to a farming one which evolved more and more sophisticated technologies. Among them is rice cultivation, pottery, textile production, bronze casting and iron forging. 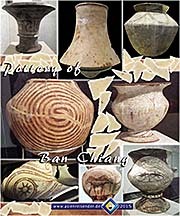 According to the UNESCO World Heritage Committee, Ban Chiang is "considered the most important prehistoric settlement so far discovered in Southeast Asia." 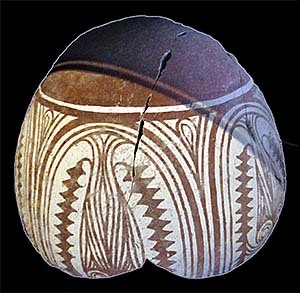 Here we find the earliest evidence of farming in the world region. 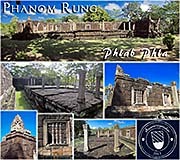 Ban Chiang Archaeological Site became a UNESCO World Cultural Heritage in 1992. Angkorean temple Banteay Srei is a very unique medieval Khmer temple. It's built in very precious red sandstone and represents the finest ornamentic of the Angkorean temples. Although the site is small compared with the great temples of Angkor Wat and Angkor Thom some 25km away, it's worth to make a detour. According to the common view there are three main sights in Southeast Asia. That's famous Angkor Wat in Cambodia, Pagan in Burma/Myanmar and Borobodur in Indonesia. Borobodur is a huge, medieval, stepped pyramid. It is the biggest buddhist temple in the world. The grand monument is built in the Kedu plain in south central Java. Built 350 years before Angkor Wat, Borobodur is much more positive in it's meaning and narrative than the sinister Angkorean monuments. It has the magnificence of a world wonder. The Dieng Plateau in central Java is as well an archeological landscape with the oldest hindu temples remaining in Java as the caldera of a huge, ancient volcano which eruption some 16,000 years ago shaped the high plateau with a number of new craters and volcano peaks around. The whole high plain is still volcanic and every few years there are outbreaks, some of them pretty hefty. Kamphaeng Phet is a historical town in northern central Thailand. It served as a medieval fortification for the Siamese empires of Sukothai and Ayutthaya. Nowadays it's part of the UNESCO World Cultural Heritage, together with Sukothai and Si Satchanalai. 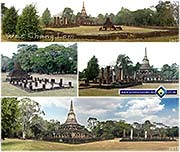 Kamphaeng Phet Historical Park is a large place within old city walls. The temple ruins, the fresquos and Buddha statues who remained and are nicely restorated show clearly Sukothai style. Lopburi is known for it's monkeys, the long-tailed macaques, who are around Prang Sam Yod and the wider circle around. But, more than that, it has a very long history which is exemplarily for Thailand's central plain. 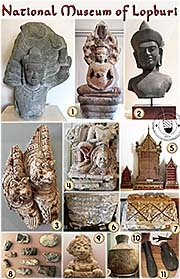 The two early high cultures of Southeast Asia, like the Mon civilization of the Dvaravati Culture and the classical Khmer empire of Angkor left their traces in Lopburi, before it became a Siamese and Thai city. It's a fascinating place to just walk around and discover by one's own all the sites who are situated on a small area. No vehicle is required for that. The best piece is the old Royal Palace which also houses the National Museum of Lopburi. The legendary town of Luang Prabang in the north of Laos is a centerpiece of the country for it's cultural heritage and it's attraction to international tourists. The historical Laotion architecture here is represented by a number of temples, of whom only one is really old (Vat Xieng Thong Ratsavoravikanh, 16th century); the others were all destroyed in the 19th century and later rebuilt. Luang Prabang is situated in the mountains on an altitude of some 700m above seal level at the confluence of the Nam Khan (Khan River) and the Mekong River. Malacca, an old Chinese trade port at the western coast of Malaya, is the most historical place in Malaysia. In 450 years of colonial history the Portuguese, Dutch and British succeeded on another. 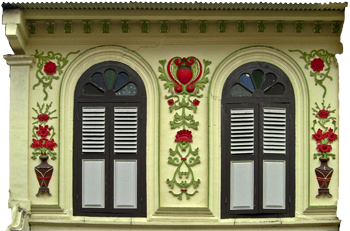 The traces of all these different influences over the centuries are still vivid in Malacca. Situated on top of an extinct volcano at a height of 381m, Phanom Rung represents maybe the finest monument of the classical Angkor period which is situated in Thailand. The sight is particularly impressing due to the fine restauration work and the location in a mountain forest. 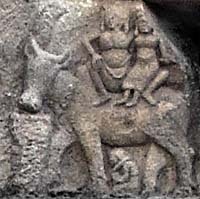 Many of the medieval sandstone carvings are of great quality. 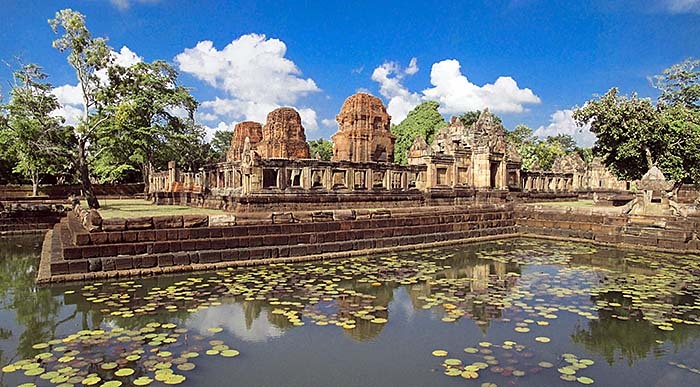 In the heart of Phimai, a small town in Thailand's northeastern Isan region, one of the most remarkable Angkorean cultural heritages outside Angkor itself is situated: Prasat Phimai. 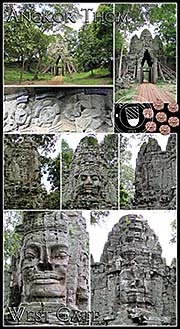 Phimai town is a medieval Khmer foundation, became the first time fortificated in the 11th century and advanced to a spiritual center of the classical Angkorean empire. Widely unknown is this little sight at the Cambodian/Vietnamese border at Phnom Dien/Tinh Bien. The five monuments on top of Phnom Bayang mountain consist of a main hindu temple from the early 7th century and four side temples. It's said they were built as a victory memorial of the empire of water Chenla over the empire of Funan. There is no touristic infrastructure at the sight and very few visitors make their way up to the mountain. It's rather an attraction for archeologists, historians and some who want to leave the beaten paths. Between Takeo (26km) and Phnom Penh another remarkable Angkorean temple site is situated. It's Phnom Chisor Temple. 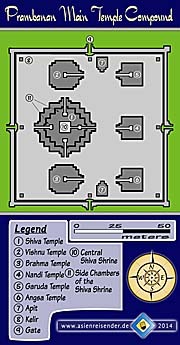 The site consists of a central shrine, surrounded by five more shrines and two libraries. They all are inside a walled gallery with an entrance and an exit gate. 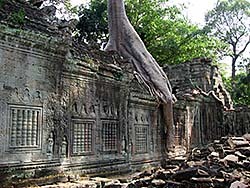 As typical for the ancient Khmer buildings the construction material is laterite, bricks and sandstone for the carvings. Prambanan is a medieval temple city in central Java. Prambanan temple compound consists of three main monuments with another three complementary temples and hundreds of more temple buildings around. The whole compound was build in the decades from 850 CE on. Prambanan is not only impressive because of the sheer size of the monuments but, above all, due to the highest quality of crafts and arts. The monuments of Prambanan are seen as a response to the closeby Borobodur monument and certainly many of the same artisans were involved in the construction of both sites. The sight of Prambanan is defenitely among the cultural highlights of Southeast Asia. Prambanan Temple Compound. Because of natural disasters like earthquakes or outbreaks of volcanic Mount Merapi the site was abandoned and in ruins for centuries. Restauration efforts concentrated first on the reconstruction of the main temples on the inner square, the central platform. What we see here in the foreground, right and left to the way, is the middle area of the former temple city. There were 224 more temples placed, but except of two restored ones all the others are nowadays merely heaps of stones. Prasat Muang Tam is a middle-sized temple of the Angkorean empire of the 10th to the 13th centuries. Although we find all the typical style elements of the Angkorean art here, Muang Tam has some specifics. There are e.g. four ritual ponds in the sanctuary who give the compound a unique style. Although it lies in the shadow of the much more frequented sight Phanom Rung nearby, it's defenitely worth to come here. Even those who are not interested in ancient architecture, culture and history might well enjoy the quiet atmosphere in the not so small park with it's plenty of green. At a very remote spot in Thailand's Surin Province at the very border to Cambodia are three small remains of Angkorean buildings to find. Coming from the next village in Thailand, Phanom Dong Rak, where the last bus stop is placed, a lonely road leads one some ten kilometers south into the jungle. 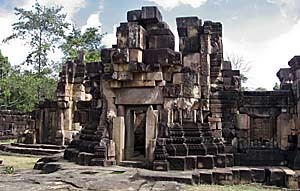 The first site one reaches is Prasat Ta Muen, which looks like a chapel with an intact roof and a hall inside. (...) Few tourists make the way out to here. Prasat Ta Muen is truly a hidden pearl in the jungle. 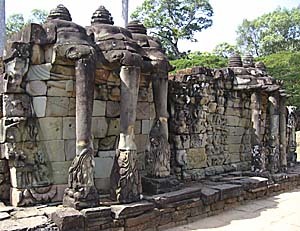 The Angkorean site of Preah Khan was once a large temple city. It lies close to Angkor Thom, the last capital of the medieval Khmer empire. Preah Khan was, for a few years, the temporary capital of the empire, until the construction of the much larger Angkor Thom was completed. The first capital of the later so powerful Angkorean empire has been Hariharalaya, about 15km north of Tonle Sap Lake. What is left of it today is called the 'Roluos Group', consisting mainly of three different temple compounds built in the 9th century. A little treasure among the main sights in the northern plains of Thailand is Sukhothai's 'little brother' Si Satchanalai. Although not among the most importantly ranked historical places, Si Satchanalai has a long history, dating back until the stone-ages. Si Satchanalai stood culturally and politically very close to Sukhothai. It's particular charm lies in the remoteness of the place, it's quietness and the fact, that there are merely almost exclusively daytour tourists visit the place. 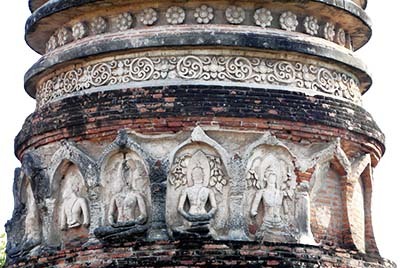 Sukhothai was a medieval town and kingdom in north central Thailand. It's heydays were in the 13th and 14th century, when it became a significant rival of the empire of Angkor and gained large territories in Indochina. Sukhothai is considered being the egg out of which Thai culture has crept out. The development of Thai script and the introduction of Theravada Buddhism happened here. Famous, but not undisputable, is the Stele No. 1, which is allegedly from the late 13th century. Nowadays the old city and it's wider surroundings, mostly plains but in the west also a mountainous area, are a large Historical Park. 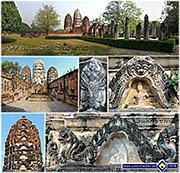 Sukhothai got declared a UNESCO World Heritage in 1991, together with the towns of Si Satchanalai and Kamphaeng Phet. It's one of the most remarkable historical sites in Southeast Asia. New Sukhothai therefore is a vibrant town with too much traffic. Though, it's the base for the trip to the necropolis, for almost all the guesthouses and hotels are placed here. Ta Prohm is, together with Angkor Wat and Angkor Thom, the third centerpiece of the sights of Angkor Archaeological Park. It has a particular charme for the archaeologists left it, despite thorough restoration, in a state as it has been in the 1920s, when a first restoration took place here. The large ruins are partially overgrown by large trees, what gives the place a mystic atmosphere. However, the abandoned appearance of Ta Prohm stands in stark contrast to the masses of touristic visitors who come here every day, often in busloads, and roam the site. Ta Prohm became famous due to a Hollywood movie with Angelina Jolie - Tomb Raider. Ta Prohm is a remarkable well-preserved 13th century Khmer temple compound. Built under the reign of Angkorian king Jayavarman VII, it represents Khmer architecture on the zenith of their arts. The main sanctuary is built in fine sandstone and shows a lot of unique fresquos who are still in a relative good shape. The sight is merely 35 kilometers from Phnom Penh, but nevertheless very few visitors find their way to it. In the past there was an entrance fee charged for visiting the area, but, probably due to the few visitors, the money grabbing is abandoned. 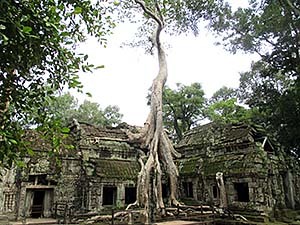 The site of Ta Prohm is not to mix up with the Angkorian temple site with the same name around Siem Reap - the famous site which is overgrown by a huge fig tree and was shown in the Tomb Raider movie with Angelina Jolie. Close by the remarkable temple compount lies another temple, which dates about a hundred years further back into the past. It's called Yeah Peau. Both temples are close to the shores of the large Tonle Bati, a sweetwater lake with a lot of high-prized, basic restaurants who are stilted on the water. Another, although pretty poor site to visit is Phnom Tamao Wildlife reserve, an animal prison a few kilometers south of Tonle Bati. Udong (also: Oudung) was in former centuries repeatedly the capital of Cambodia, before the royal court moved to Phnom Penh. Little is left of the old place, except a mountain with a number of mostly old stupas who served as burial places for the Cambodian kings. Udong was also one of the about 20,000 killing fields. A small stupa displays some skulls and bones behind glass, similar to the memorial stupa in Choeung Ek near Phnom Penh. Some 15km away from Udong lies Lovek, which served also as Cambodia's capital in the 16th century. Wat Phou Champasak is not only an extraordinary Khmer temple (see: 'The Empire of Angkor') but a whole, planned landscape of medieval times, dating back in it's origins before Angkor. It's stretching from the Kao Mountain over 10km down to the banks of the Mekong River. 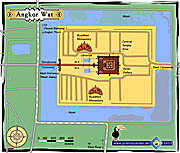 It includes a large main temple complex with waterworks and an axis way together with some side temples and two ancient settlements.